Schools were canceled here today due to freezing rain. I have the car since i drove my husband to work and did get to my lap swim, but then I didn't have to tutor this afternoon. I finished two more heart sachets which are still only pinned closed because I'm going to add dried lavender once I pick some up this afternoon. I'm going to add them to my Etsy shop in the next few days. Next, I decided to take apart the last step in the pyramid bag that I showed the other day, so I could reverse the end that the zipper pull ended up on. I'm showing it again because I'm still looking for the perfect tutorial that I could print out. The one I used might do if I made a few of my own notes on it. 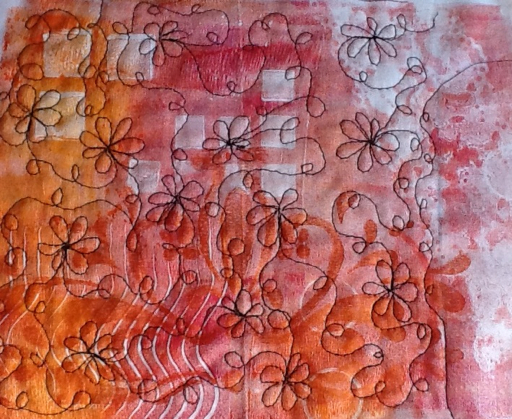 I think it's a fun way to use some of my painted fabrics. 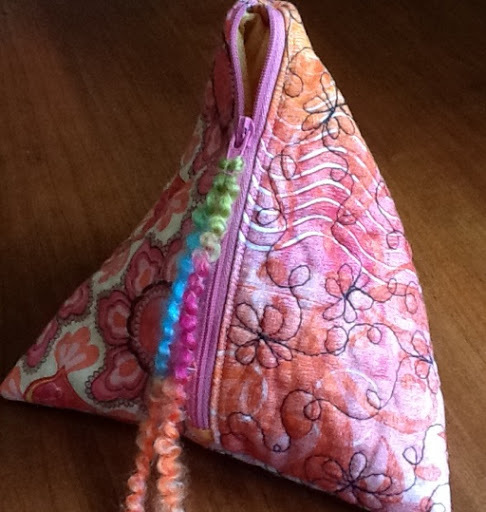 Just curious if anyone has a pattern or tutorial that they like for a pyramid bag. 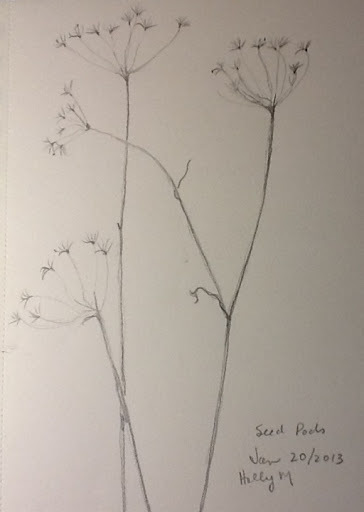 Most flora I find quite easy to sketch because the shapes are organic and it doesn't really matter if a line is a little off. 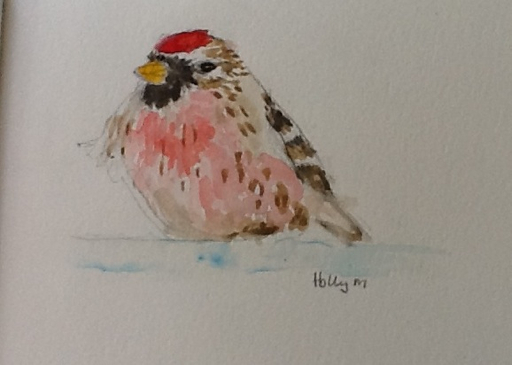 I love to feed and watch birds, they fascinate me and it follows that I would like to be able to draw and paint them. One needs a little more attention to shape, proportion and detail in order, for example, for a plover to look like a plover. 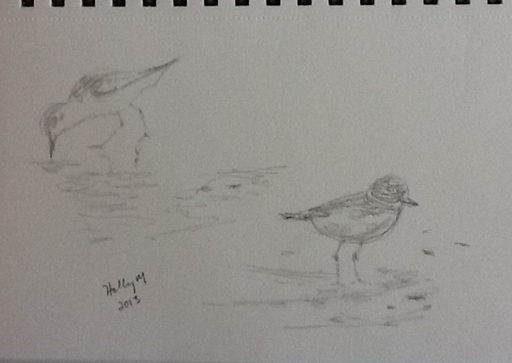 I have a friend who wants some paintings for her cottage and plovers would be perfect as they're seen on her beach. 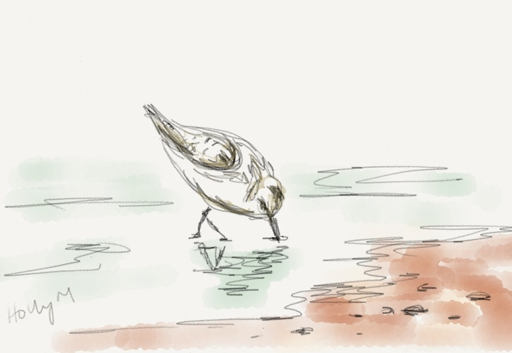 Last night, I did a few 5 minute sketches, two in my sketchbook and one on the I pad. It takes practice on the I pad but I think I'm getting better. 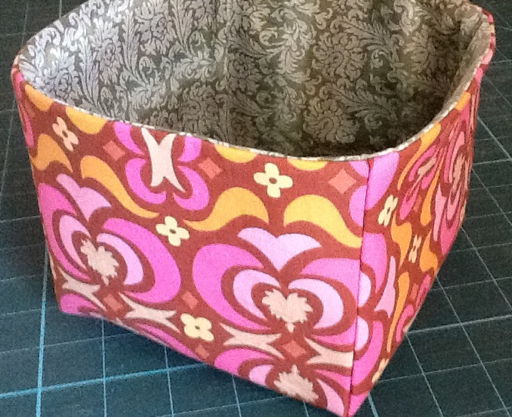 This afternoon, I decided to use another one of my hand printed fabrics to make a pyramid bag. I followed a tutorial here. Last year I made one that didn't have a lining and then I found this one. I made it for the first time today. The directions were confusing for me because she didn't mention sewing the lining to the zipper too in the first step. Once I figured that out, I still had a bit of confusion figuring out how to stitch the lining and right sides together. I got it done but did end up with the closed zipper tab on the bottom of the bag, not a huge deal since this one is for me. I want it to carry my mug to my guild meetings. Finally, I'm able to post about my finished runner. I even finished hand sewing down the binding! I tried every room in the house but was not able to get a good full on picture where the details on the velvet areas and the feathered machine quilting would show. You've seen some details before. The next photo shows some. Today, I opted to stay inside. Even though its warmed up to about -10 C, it was very windy again. I've been sewing together more hearts from the piece of fabric that I painted a few days ago. These two are stuffed but not sewn up yet because I think I might pick up some dried lavender to add. They would be nice hung in a linen or clothes closet or perhaps near a bed. Lavender is supposed to be relaxing. 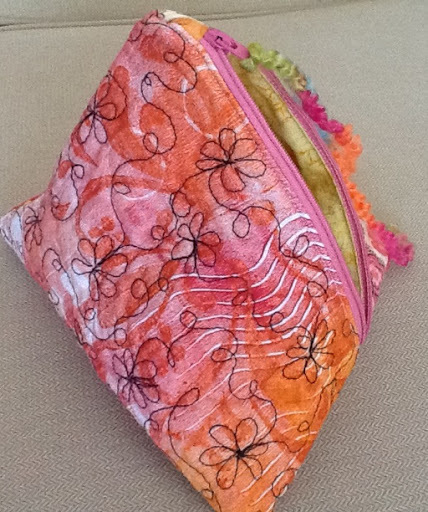 I'd love to think up more fun things to sew with painted fabric as it's so much fun to do. I am not able to produce as much because I'm now tutoring two afternoons per week which cuts into my sewing time and thus I don't have as much to post about. Yesterday would have been a studio day but I took a trip with my quilting friends to visit a member of our group who moved just over an hour away from here. 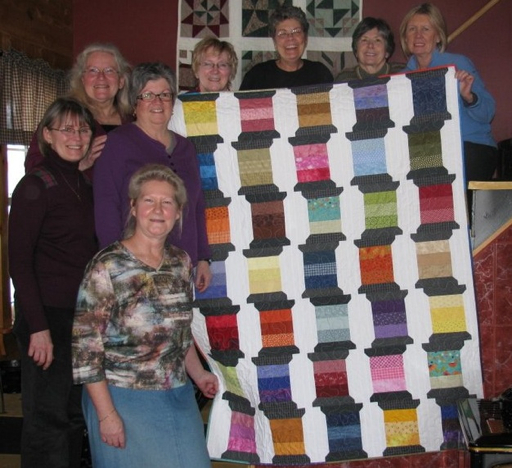 We've been together as quilting friends for a dozen years or so. We got to visit her new sewing room addition and we surprised her with our traditional gift of a quilt for the 60th birthday. 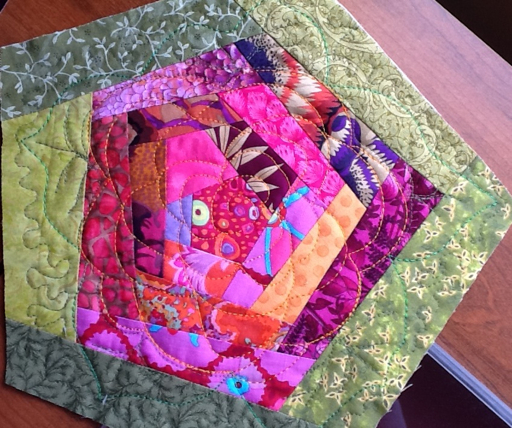 I think it is such a pretty quilt! The birthday girl is in the front. I'm standing in the purple shirt right behind her. I've promised myself not to post about my recent project again until its completely finished. Maybe tomorrow. We are have a cold snap here right now and I'm having trouble staying warm no matter what I do. The key is to keep moving but sometimes I tire out and have to resort to heated bags and blankets. The sun is shining though and since I didn't get out yesterday, I went for a walk. I bundled up and was plenty warm. It's once I come back in that I get cold. This morning, after hanging some heavier draperies in my dining room, I went to my painting table and played with some paint and a scarp of white cotton. 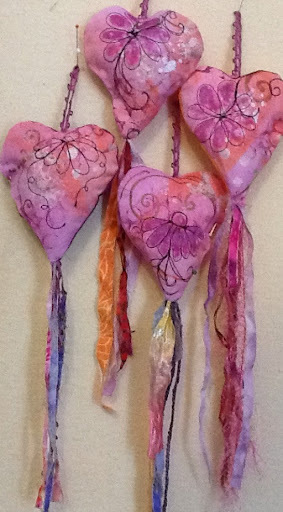 I plan to do some free motion work on it, sew it into hearts and stuff them, just like the one I did last week. 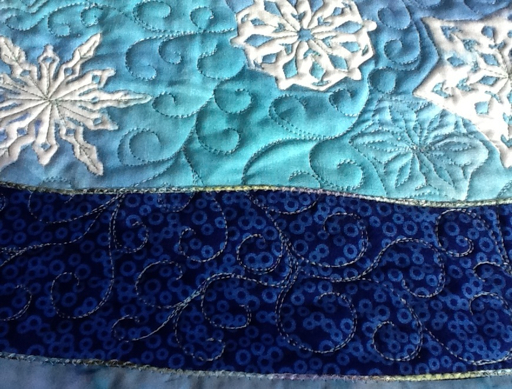 I spent a bit of time after lunch stitching around more snowflakes and making feathers. 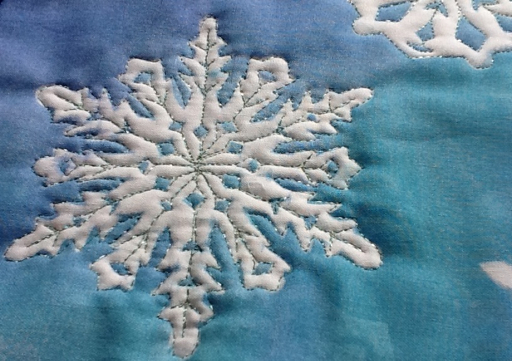 I've gotten a couple of the snowflakes done on the velvet but it doesn't show. Once I've finished, I'll try using my good camera on the velvet. I won't have a chance to work on it now until the weekend. I've started tutoring a student on two afternoons, Wednesday and Friday and I'll be away on Thursday. For now, I'm going to make a hot chocolate and curl up with my book. I did a bit of housework this morning, the whole while thinking about getting to add more free motion quilting to my runner. I got the centre of it done, but as sometimes happens because of my Addison's, I ran out of steam. The next section where I want to try feathers because they remind me of a frosted window, will have to wait. 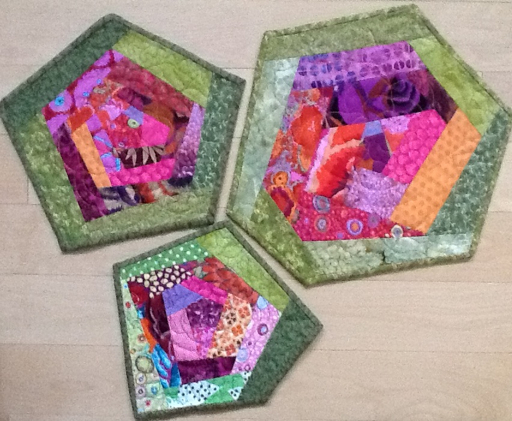 I'm happy with the quilting which is not always the case. I took my time and did a pretty good job. 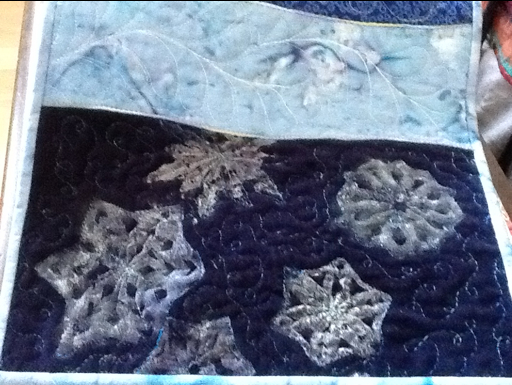 Then I couched some decorative fiber to the seams between the dark blue sections. That went well too although I'm going to inquire about another couching foot as my present one is fiddly and hard to control. I think it will take a couple more sessions for me to finish this project up. 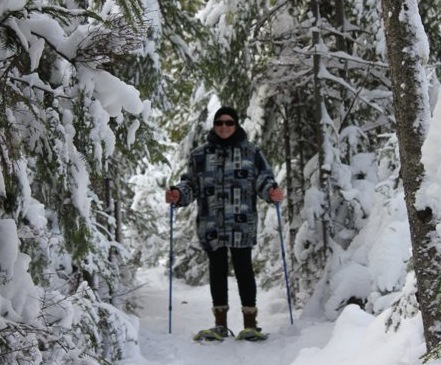 Gord and I went snowshoeing this morning before the snow got too heavy. 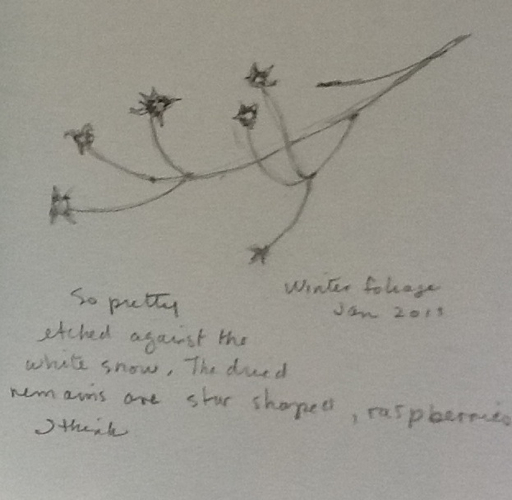 I gathered a few more seed pods that were sticking up etched against the white snow background. I thought it would be interesting to show a sketch done in pencil and then done with a stylus on the I Pad. The first one is pencil. Sorry, the detail isn't perfect as I took it with the I Pad after dark. The next one is a simplified version done with the stylus and the Paper 53 App on the I Pad. 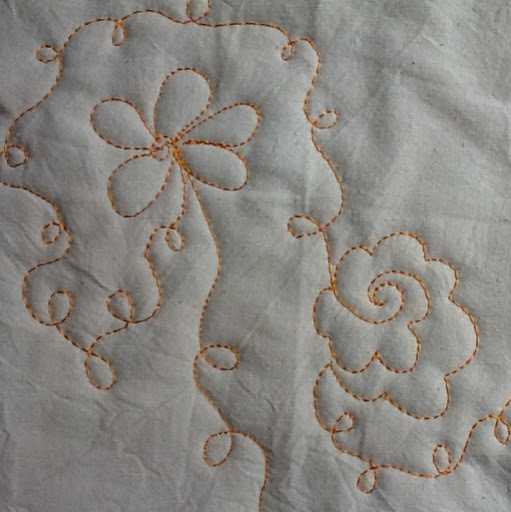 Simple lines, a little shaky, but translatable into stitching lines. Fodder for future work. G had to go in to work today so I had to miss my UFO day. I made the most go it though. This morning I was a little slow to get myself up and moving due to a cortisone adjustment I had to make. No need to go anywhere or do anything though. Eventually I made some muffins and then got to work sandwiching my runner. 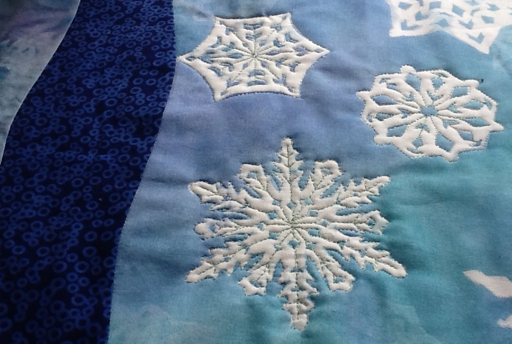 After my lunch, I started the free motion quilting working on the snowflakes in the centre. It's sle going because you can't rush it when using the Hollow Shimmer threads. 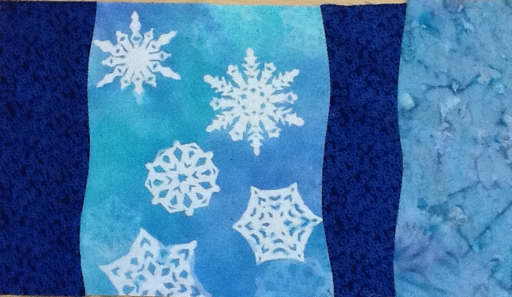 I'm really pleased with the bottom snowflake. It really makes me happy! Here you can see it in a but more detail. Here is one half of the runner. I'm thinking of putting feathers in one of the narrow middle sections. Some of you (you know who you are) may be wondering if I'll get over this snowflake stage. I can say that ever since I made the little heart shown in the last post, I've got a hankering to do more. I see some pink and orange ones in the future. I picked up a book I had on order from the library yesterday which I must recommend. It's Beautiful Mystery by Louise Penny. I've just started it but I'm into it already just as I was with all her other books. She writes good old fashioned mysteries with lovely characters. I'm just going to settle in with it now for a bit. This morning I put together this little stuffed heart to be used as a gift. I've added a bit of stuffing. I think it would be great with a bit of lavender in it to be hung in a clothes or linen closet. Immediately after lunch I went for my walk down the trail. It's supposed to get very cold by tomorrow and I'm pretty sure the temperature dropped while I was out. While I was anxious to get home to start piecing together the table runner, I took the time to relax and feed the chickadees. I had time after that to get a few pieces cut and sewn together so I'm starting to see my idea come alive. 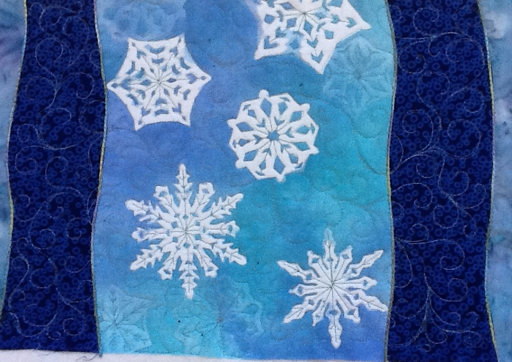 The section with the snowflakes will be in the centre. I will do roughly the same thing to each side. Tomorrow, I'll look for a backing fabric. 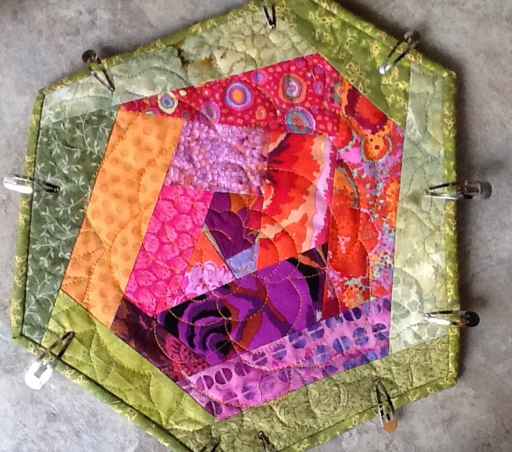 I'm quite looking forward to the free motion quilting on this piece. Next you can see it with the piece of velvet to the right. It will also be added with a curved seam. 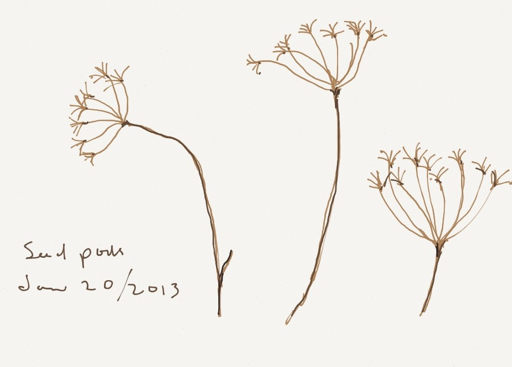 In the evenings sometimes, I've been making a habit of sketching some of the bits I pick up on my walks. It's meditative and doesn't require a lot of energy. Yesterday, we made the 3 hr 15 minute drive to Fredericton for a doctor's appointment. The quilt shop that was there is now closed, so I could only shop at Fabricville. I don't have a membership card because I only get there about once a year. They've changed their policy and most of the sales and specials only apply to those with a card. And wow, fabric prices have gone up! I bought a couple of pieces that I need now and I think I'll order the rest online. Even with shipping, it's cheaper. 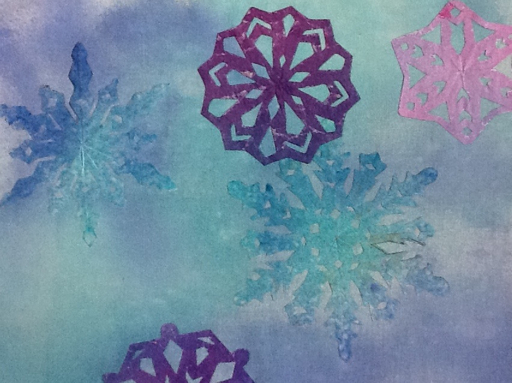 Here is the white cotton with my stencilled and spritzed snowflakes all finished. 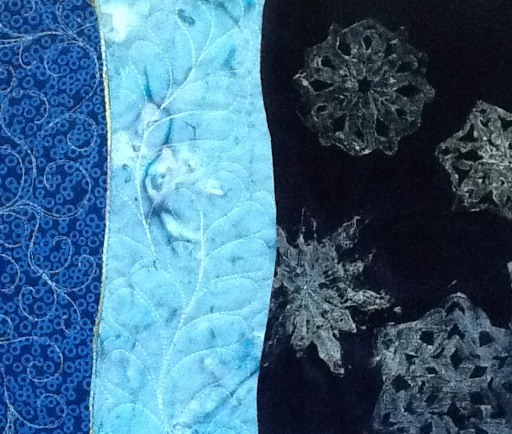 I picked up a couple of batik pieces that I thought would match and I've added a piece of royal blue cotton velvet that I've used discharge paste on. It was a bit fiddly with the paper; I applied the paste with a sponge brush and then pressed wax paper over it once on the velvet so that I could rub it. I had no idea if it would work until I ironed it. 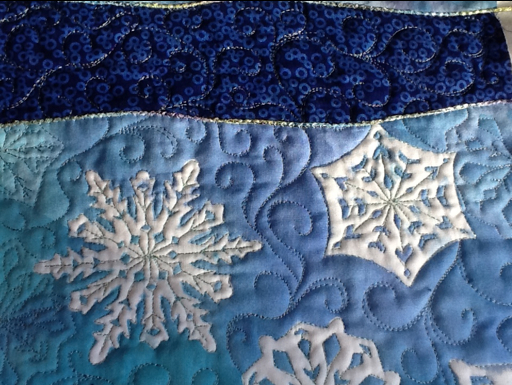 The snowflakes are even clearer and brighter than I expected or wanted but it will work fine with some machine quilting. 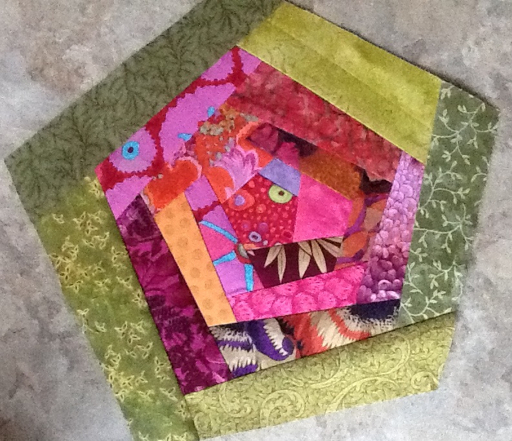 The plan is to piece and quilt a table runner with the different fabrics. I can't wait to put it together but it will have to wait until tomorrow. I'm off to the library to tutor an adult student from the upgrading class where I used to teach. My priority is my health and when it's such a mild winter's day as it was today, I need to get outside. We are having a real January thaw right now- it was about 9C- and one must take advantage. 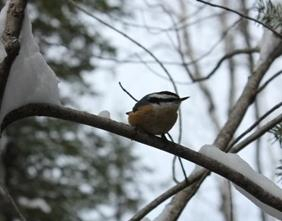 I went for a walk on the trail, feeding a few chickadees here and there. I did get the iron on backing cut and ironed onto the outside piece of my bag. I've also gotten the machine set for FMQing and started a small bit. That's always the important part for me. Now it's easy to sit down and do some here and there. 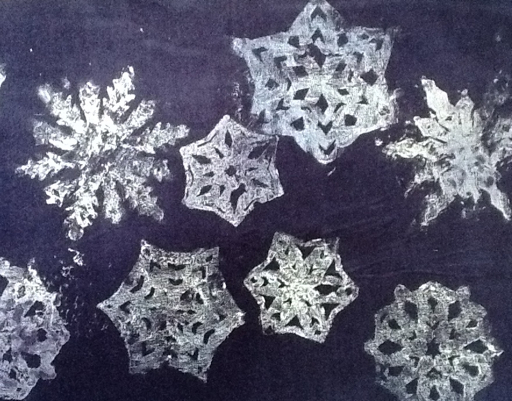 I've still got my snowflakes on my mind too. 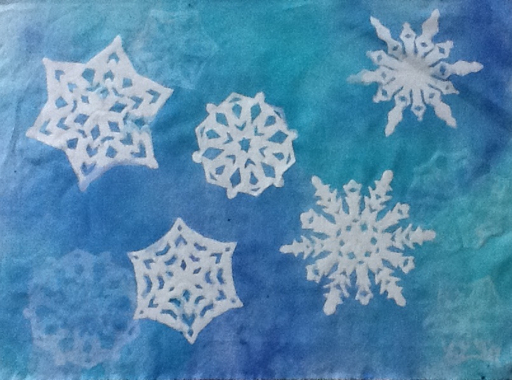 Last night, after researching more sites on paper snowflakes, I sat and cut a few more out. 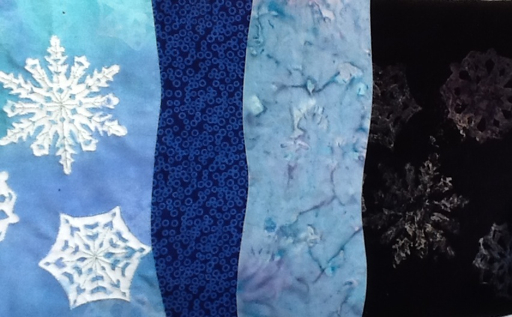 Here you see them layered onto white cotton with the fabric paints spritzed on. 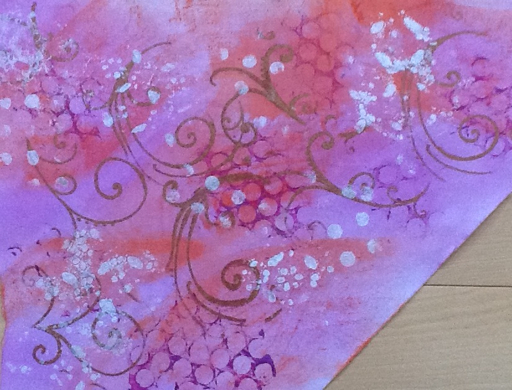 I have a table runner in mind this time but I'm looking for a batik to go with it. I've nothing in my stash, so I've asked my friends before I resort to ordering something. Last year I did a piece of artwork for a friend who made it into a sewing machine cover. In exchange, she agreed to put together a bag for me. Because I wasn't really inspired and couldn't decide on a pattern, I never got it started until this weekend. This week I was going through a bin of past starts and found one of a tree. I've done more since that i like better, but this one was larger so I thought it would fit nicely into a bag. It doesn't need to hang on a wall as artwork, so a few imperfections are OK. I picked up the check which is a home dec fabric at the little shop I visited on Friday. It doesn't look very big in the picture but it actually measures about 23 by 26 folded in half. Now I just need to layer it with batting and quilt it. I'll have to see if there's something in my stash that would suit as a lining. Also, I need to make some pieces for pockets. 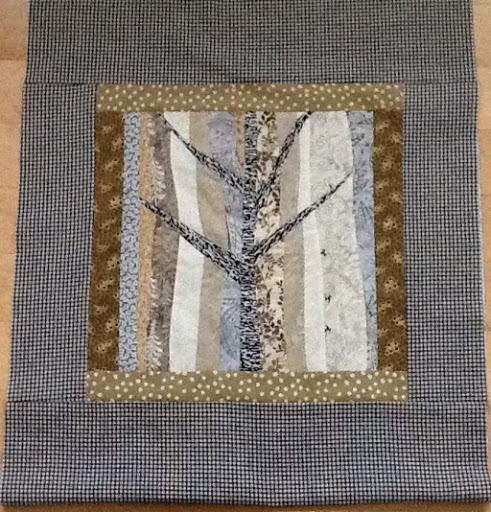 I need to give it some thought as to how I will quilt it as well. I do plan to outline the tree and probably fill in with a leaf pattern. Not sure how I'll quilt the black check though. Any ideas? Today I went with 2 friends on a 1 1/4 hour drive dowshore to a little quilt and yarn shop in a ladies house. It's surprising the variety of fabrics and supplies she has there. I bought a piece of home dec fabric to make a bag to carry to UFO days. It's in the wash right now. 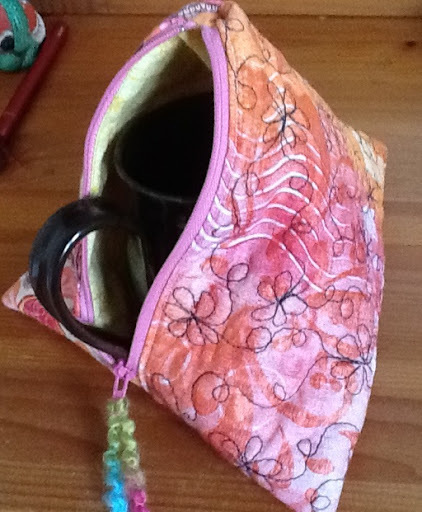 Yesterday, I finished sewing the last two bindings on the crazy patch mug rugs. You can see the variety in the size. I'm using the largest as a table topper in my living room. The other ones may be gifts as the need arises. At the moment I'm sitting at my dining table with my tea. I've been sketching. I read on a blog yesterday that January can be a soft, quiet meditative month and I find that to be especially true here in the north where it is cold and dark in the morning. I wake up and get moving slowly. Combine that with a trying time that we are going through right now- nothing life threatening or too serious, perhaps life changing- and I really feel the need for quiet time. 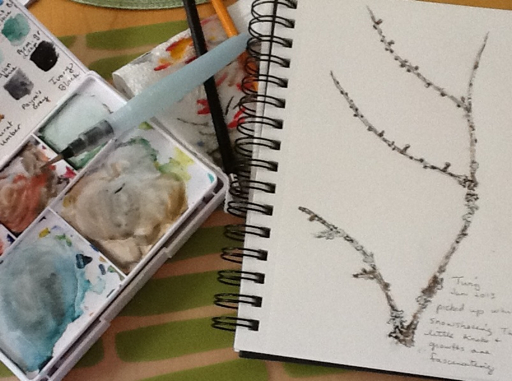 Perhaps that is why I've turned to my sketchbook. Also, i have these twigs lying about that i collect when I'm out walking the trails. I can't help but notice the little bits of twigs that stand out against a backdrop of snow. 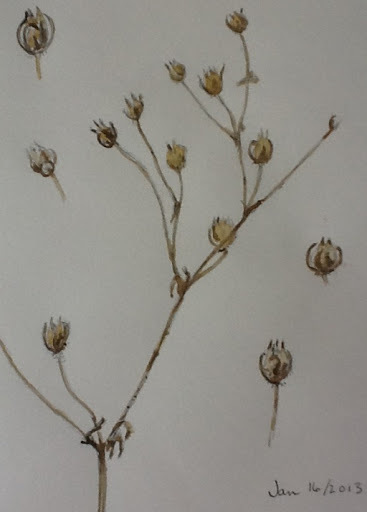 It slows one down even more to hold it in your hand, quietly examining and sketching the details. It requires focus and stillness to capture the tiny details. The tiny knobs on these twigs fascinate me. I only notice them this time of year when they're lying on the snow. Now, I'm on a quest to see which tree they come from. Today is another sunny, mild winter's day and it lifts the spirits just to be out doing a few errands. There's no wrapping oneself up like a mummy and running for the indoors as fast as you can. I enjoyed it turning my face to the sun and to absorb the rays. It'll be cold again soon I'm sure. 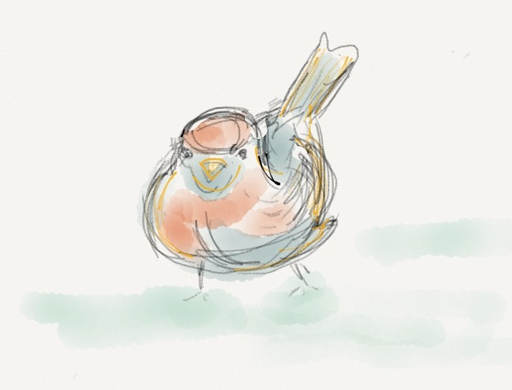 I did a little bird sketch using the Paper 53 App. It is a bit awkward using the finger as you can't see exactly where the line will fall. I may have to break down and get a stylus. Also, I think I need to purchase more colours. I did another little watercolour still playing with some of the images I see this time of year. The sun came out and the temperatures warmed up this afternoon, so I took myself out for a trail walk to improve my spirits. It never fails to help, deeply inhaling the deep woods air, watching the chickadees swoop in for their seeds. 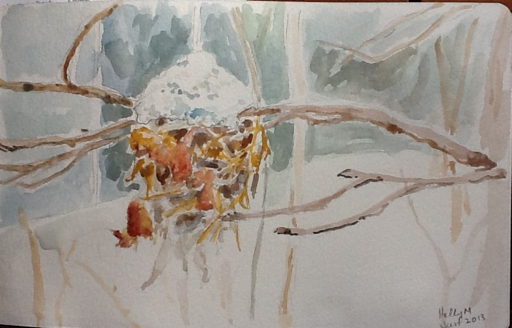 I've been thinking about this nest that I pass by regularly, wondering if I might reproduce it in fabric and thread. I've done a quick little watercolour today to get a feel for its shapes, colors and shadows. 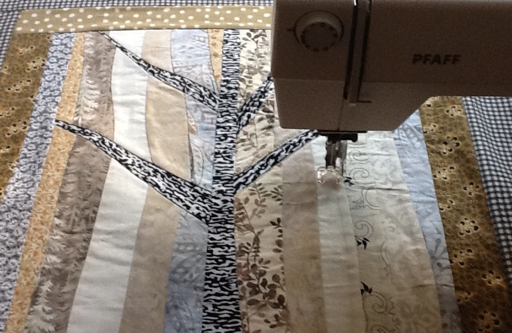 I'm calling it Gone South and will need to play with it some more before moving to fabric. A few touch ups are needed here too, but you get the idea. As it is brutally cold outside, I've spent the day doing some housework and cleaning up things in my sewing room. 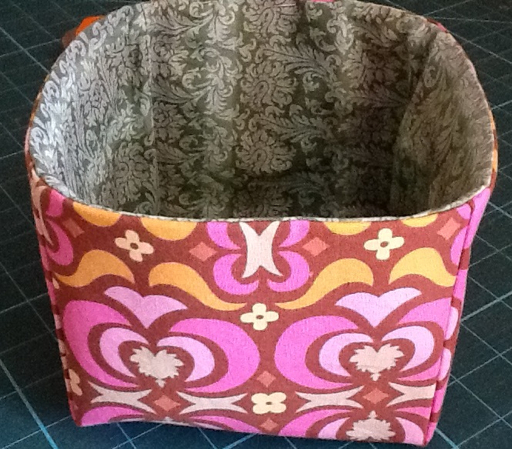 I found a tutorial for this fabric box and felt inspired to make one. Don't know why, just because. It finishes at about 5 inches square. I've also been busy adding a few items to my Etsy shop. Do take a look if you have time. I've not gone near my sewing machine today. We went snowshoeing this morning and visited my husbands parents this afternoon. I mixed up a casserole of wild rice,tomatoes, salsa, black beans and cheese which is in the oven right now. 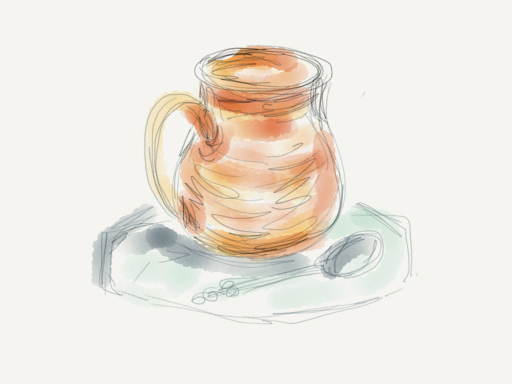 I sat down with a hot chocolate to read and found myself doing this little sketch of my cup using the Paper 53 App. I don't think I would bother getting a stylus as I kind of like the freedom and simplicity of using the fingers. I've been finishing up and putting the binding on a few small projects. 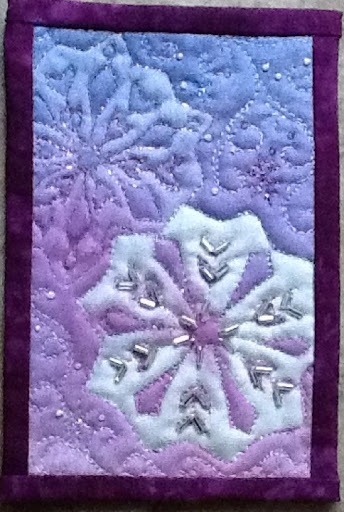 This 4 by 6 postcard is the only one with the binding stitched down. I may stitch while watching the news to-night. 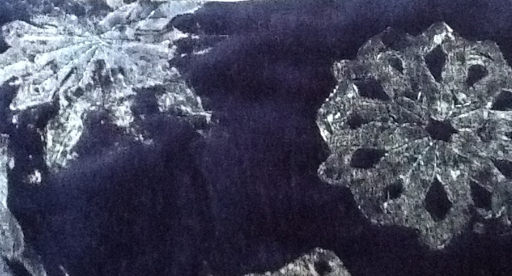 Tomorrow is our first UFO of the new year and I'll be working on my brothers batik quilt. I'll try to remember to take some photos. When I finished piecing my crazy patch rose mug mat, I thought that the Wonderfil Accent threads I ordered a while ago would be perfect to experiment with. I got quite frustrated on the first one when the thread kept shredding at the needle, so I did some research and reached out to a friend. Thanks, Monika! After much experimenting, I solved the problem and was able to do this test piece without a break in the thread. After trying everything else that was recommended, I came across something about scratches or nicks in the throat plate. Upon examining mine, I noticed that mine had them and when I lowered the threaded needle, I could see that it was rubbing against the front of the plate where it was scratched. I consulted with my husband, he sanded it for me, and it worked. I finished the second mug mat without a break! Very happy! 1. Change needle type and size. I ended up using a metafil 80/12. 3. If thread is on a cone, feeding it from a cup behind the machine will help. I added a taped on plastic covered paper clip to feed it through following a friends suggestion. She uses a safety pin. 4. Check for scratches or burs on throat plate. Worked for me! 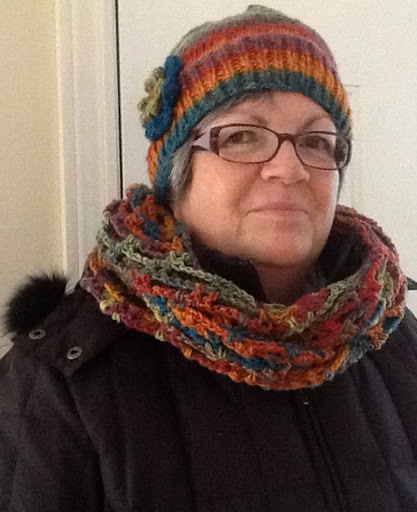 Finally, I did say last week that I would post a picture of my finished Infinity scarf and hat. It's not my best picture , but here it is. I look a little mischievous, I think. Sometimes I remind myself of the CBC radio show called Madly off In All Directions! I get an idea for something different for a change and I have to go with it. 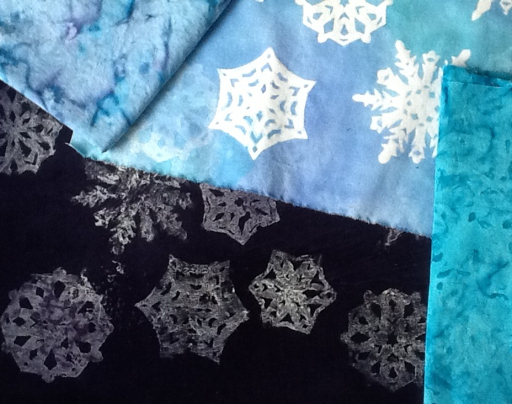 It's fun to just grab some fabrics and crazy piece them together, willy nilly, the scraps flying everywhere. Maybe it had something to do with watching the Rose Bowl Parade. I finished quilting the first one which is quite a bit larger than the next one although you can't tell from the pictures. The first one would be great on a small dresser or table. The second one is more mug mat size. They're so cheery on a windy winter's day! Just before lunch, at the warmest part of the day, we got out on the snowshoes for the first time. I was so exhausted when we got home that my husband made me lunch and I curled up with my new afghan (made by my mother in law) to watch the parade. I caught this little fellow near a feeder that someone had built into a tree. I always regret not carrying the telephoto lens. It has been a perfect day, spending time in the outdoors with my husband and doing the things I love.